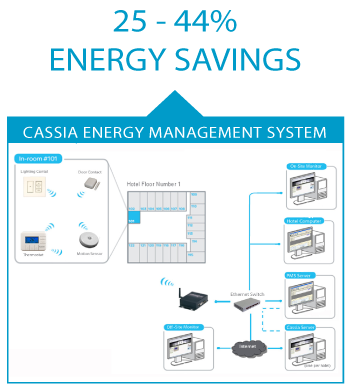 The Cassia Energy Management System tackles the largest culprits of energy waste in hospitality – heating, cooling and lighting – through the innovative use of room automation. This dramatically reduces the amount of energy wasted to heat or cool an unoccupied room. The Cassia web-based central control software provides hotel staff with meaningful information regarding each room’s energy performance. The Cassia Energy Management System automatically triggers adjustments in temperature and lighting when guests check in and out, or simply step in or out of the room. This not only creates a customized guest experience – based on conservation estimates, 25 – 44% in energy savings per room can be achieved in virtually any hotel, dorm or multi-unit dwelling.